What are USGS Topo Maps? If you’re looking for topographic maps for the United States, the first place to look is the USGS topo maps series. Since 1884, the purpose of these general use maps has been to display the complex, changing geography of the United States. This includes hydrography, place names, contour lines and cultural features of the nation. So how do you get your hands on USGS Topo Maps? We show you 2 quick ways to download USGS Topo Maps. Currently, the most recent version is published as “US Topo” and stored in digital format on the TNM Viewer. Depending on your needs, you can choose “US Topo” or “Historical Topographic Maps” in the TNM Viewer. Otherwise, you can download the raw vector and raster GIS datasets in the bottom option. By default, your current extent is the search area. However, you can enter latitude and longitude coordinates or draw a polygon extent to change it. Also, you can filter by date period in the advanced option. Finally, you can click “Find Products” if you want the current “Topo Maps” or the “Historical Topographic Maps” version. From here, it’s a matter of adding your items to your cart and downloading it as a PDF. 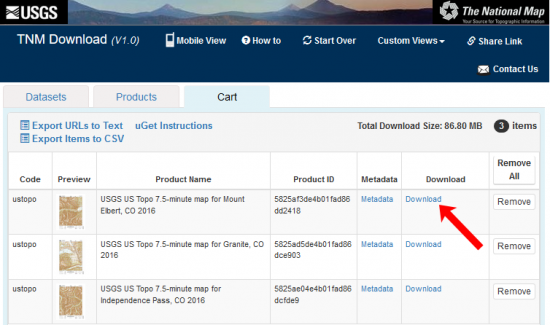 For the US Topo maps that you want to download, simply click the “Download” button under the “Cart” tab. Of course, the advantage of TNM viewer is that you can preview the USGS Topo Map before you download it. Unless you want topo maps in Alaska, they are based on 1:100,000 and 1:24,000 scales. As part of the Historic Topographic Map Collection (HTMC), you can filter USGS historical topographic by time period. Simply, move the time slider and it will filter and preview the Topo maps. Similar to the TNM Viewer, add items to your cart that you want to download. In order to do that, you have to click anywhere on the map. In addition, you can preview the topo map in the viewer which is a neat function. From here, you can download the JPEG, KMZ, GeoTIFF or GeoPDF by clicking the option on the right. The USGS TopoView was specifically designed for the purpose of time. Because you can preview images and filter with a time slider, these qualities make TopoView extremely intuitive for the end-user. PDFs and raw data aren’t the only two ways to view USGS topographic maps. If you have any GIS software installed on your machine, you can consume web mapping services like these National Map Service Endpoints. All you have to do is add these URLs to your map. When you just want physical prints, you can visit the USGS store to get them delivered at a cost. Overall, the natural and physical landscapes in the USGS topo maps have become an extremely valuable basemap source of data. Check out these sources and see for yourself. Good references and info. New users or inexperienced users will be able to use these! Could you please lead me to the download site?